Haby Barry, Founder of Fulaba and Diaraye Barry, project collaborator embarked on a journey to showcase women of the African diaspora in contemporary and traditional styles last month in Guinea. The project is the beginning of a series of shoots with final photo selections and supporting commentary to be compiled into a coffee table book. We are grateful to have had the pleasure to work with Guinean fashion designers, Oumie Camara, Madeleine Sarr and Talibé Bah. The shoots featured Guinean women from Conakry with various ethnic/tribal origins: Khadijah – Fulani, Houssainatou – Soussou and Fulani, Naime – Soussou and Lebanese and Bintou – Tukulor. We adorned these women with various pieces of Fulaba jewelry complementing their African attire and accentuating their natural beauty. 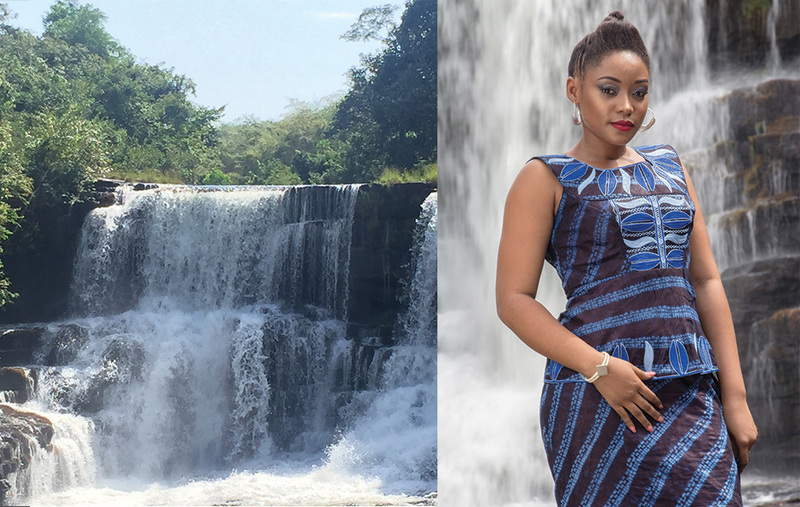 Day 1 of our photo shoots took place at the breathtaking waterfalls of Soumba in Dubreka, about an hour outside of Conakry and in downtown Conakry with Youssoupha of Psypic photography. Day 2 of our photo shoots took place at the site of Kilissi waterfalls in Kindia with photographer, Khabrim Diallo. Our goal was to take photos in natural settings showcasing not only the beauty of Guinean women but also the beauty and magnificence of Guinea. Soumba waterfalls is pictured on the left and shot by Haby on iPhone. Naime pictured right at Soumba waterfalls is wearing Teranga Couture by Talibé Bah featuring traditional indingo fabric with embroidery and Fulaba silver Fulani earrings paired with the silver Fulani bracelet, shot by Pyspic photography. Naime’s hair was styled by Haby Barry and her makeup is by Bebe Saran. Fantastic! I look forward to the publication of the coffee table book and I’m pleased to have the names of these faahion designers. My husband is from Conakry, and learning about the fashion and history is really valuable for me, as well as for our Australian family.